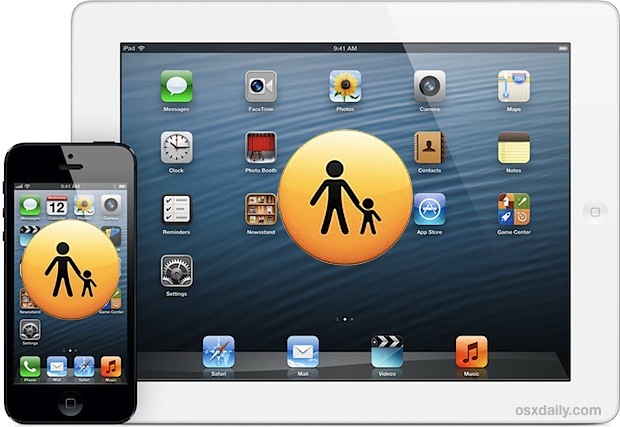 If you plan on giving an iPhone, iPad, or iPod touch to a child, take a moment to set up some very basic parental controls on the device by using the Restrictions feature of iOS. It only takes a minute to configure, and this will prevent the access of inappropriate content, avoid mature themed media, prevent in-app purchases and incidental charges, disable the ability to download and install new apps, plus prevent the removal of apps that have already been installed on the device. app removal in general are highly recommended. Optionally, you may want to adjust Location Settings as well, though it’s best to be targeted with this and turn off geotagging with apps like camera and photos. Turning off all Locational functionality is often undesirable because it prevents the meaningful usage of apps like local encyclopedias, weather, maps, and those relentlessly fun and educational starry night apps. 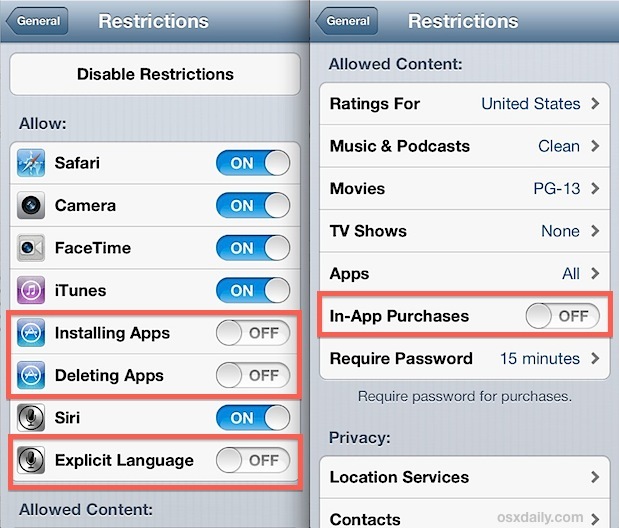 These options are the same in practically all versions of iOS, though you will find past versions of iOS may label the Restrictions settings as “Parental Controls” instead. Additionally, iOS 7 includes an option to limit certain web content by age level as well. Going further, you can also hide unwanted apps like Safari, App Store, iTunes, iBooks, FaceTime, or going so far as turning off all third party apps, and even disable the camera if you don’t want it to be used at all. Finally, there’s the option of using Guided Access to lock an iPhone, iPad, or iPod touch into a single application and prevent it from being quit. We like to refer to Guided Access as Kid Mode because it’s incredibly effective at keeping even the most curious youngsters from accidentally exiting out of an app or doing something undesirable on the device, and it can make for an excellent quick way to hand an iOS device off to a young one without worrying about accidental usage. Nonetheless, Guided Access is no replacement for using effective restrictions to prevent improper use of a device, and the features are best used separately with full understanding of their limitations and benefits. These quick setup tips come to us from Mrs Anderson (thanks! ), a teacher with a handful of iPod touches in their classroom. Obviously this is useful outside of educators as well, and many parents, grandparents, babysitters, brothers, sisters, just about anyone, should find some useful tricks here if they’re going to be sharing an iOS device with kids. I’ve placed all of the above parental controls on my son’s iPod Touch 5 but he still access questionable material through Maps, if you can believe it. How do I delete or disable Maps? Please tell me it’s possible. Kids can access the internet through just about any app and I can’t figure out how to block it within an app! My kids know how to search YouTube from the klove app which is Christian radio for crying out loud! The explicit content is pervasive and virtually impossible to block! If anyone knows how to to block web searches in apps please tell me! I’m just about to throw away all the smart phones!